Bored Yak: Happy New Year! How do you measure a good year? By all accounts, 2011 was good to me. Since this blog is about snowboarding, let's review that. Last winter was all-time. Snowfall was plentiful, the trips I took mostly panned out and I got a few firsts that blew my mind. Watching the gnarly sessions at Superpark 15 at Mt. Bachelor won't easily be topped. The highlight of the season was still my first heli trip as part of Tailgate Alaska, but I also had some of my best days at Mt. Hood Meadows, just finding new zones with my friends. When June rolled around, I was ready to hang up the gnar boots and lace up the hiking boots. The one thing that bummed me out last year was a trip I took to Mt. Bachelor over Martin Luther King Jr. Day where it rained on the mountain the whole time and none of us so much as touched our boards. I even had a friend up from Colorado. And I forgot the shred flicks at home. We drank so much beer... During a normal year it would have been far more depressing, but last year turned the corner, just like this year is sure to do. Like Joe Walsh said, "I can't complain, but sometimes I still do." In the young 2011/2012 season, I've already had firsts. My first ever snowboard race was a couple weeks ago at the Dirksen Dirby. My result was as bad as it gets, but it was still a super-fun experience that I look forward to doing again in the coming years. Also, a couple months ago I wrote my first ever published snowboard article for Transworld Snowboarding magazine (Halldor Helgason's Pro Spotlight, Dec. 2011). 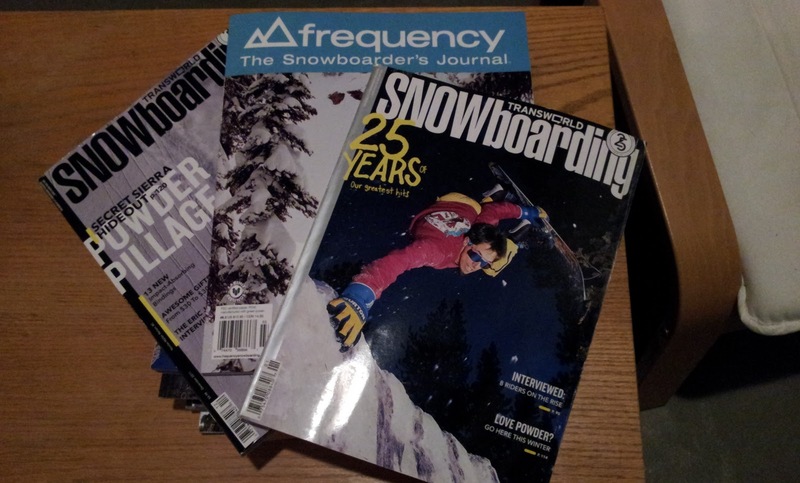 Following that were two in their January issue (Ethan Deiss and Austen Sweetin interviews) and one in frequency: The Snowboarder's Journal issue 9.3 (Mike Parzialle profile). Theses I hope will be just the first of many gigs with the big mags and finding ways to get money for things that I like to do anyway. The three best magazine issues yet! The riding this year hasn't been amazing, but the season is long and just taking off. Starting in the new year, a friend gets a weekday off, so last year's Method Mondays will be this year's Tindy Tuesdays. Even as I mash this keyboard it is dumping snow both at Mt. Hood and my New Years destination, Mt. Baker, so things are turning around quickly. Maybe that Nina chick is going to show up after all. Here's hoping that 2012 greets you with nothing but powder and smiles. Happy New Year from Boredyak!